CBD Oil for Cats With Seizures - Can CBD Help Cats With Epilepsy? Does your cat suffer from seizures? If so, I’m sure you’re desperate to find a reliable, safe medication to help relieve her symptoms. CBD promises to help drive down seizures in humans, but does this stuff work for cats and other animals? In this post, I’ll show you exactly how CBD works to reduce seizures in cats and even recommend a few CBD products designed specifically for felines. Seizures in cats can be caused by many different things. Some cats may experience regular seizures as part of a congenital condition like epilepsy (which I’ll explore in more detail below). Low levels of oxygen in the blood. Anemia, heart conditions, or diseases affecting your cat’s breathing may cause a sudden drop in blood oxygen levels. Brain tumors or brain damage. Toxins like permethrin (found in flea products), bromethalin (found in rodenticides), or even certain medications (mirtazapine, ibuprofen, diphenhydramine, or some antibiotics). Disorders of the kidneys and/or liver. What Causes Epilepsy in Cats? Epilepsy is a brain condition that you may already be familiar with, seeing as it affects humans, dogs, and other animals. The effects of epilepsy on cats are pretty similar to its effects on humans. The main symptom of epilepsy is regular seizures that can cause a variety of pronounced physical symptoms, including shaking, chomping of the jaw, salivating, urinating, and more. These seizures are caused by a misfiring of the neurons in the brain which are responsible for sending information around the body. When these neurons start firing off signals in an abnormal fashion, a seizure occurs. Unfortunately, the root cause of epilepsy in cats isn’t clear. 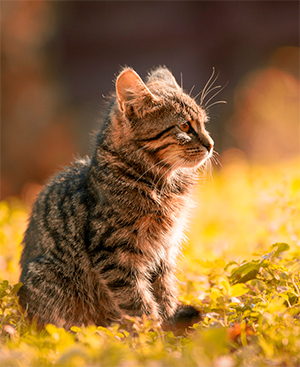 Epilepsy starts to present itself in cats aged 1-4 months. It can affect cats of any breed and is a chronic condition with no cure. There is evidence to suggest that it’s a genetic condition, but it isn’t enough to suggest that genetics is the sole cause of epilepsy. What Does a Cat Seizure Look Like? Feline seizures are pretty shocking. The “Aura.” This is the period just before a seizure takes place. You might find your cat meowing, seeking out attention, pacing around or acting restless. The aura tends to last only a few minutes. The “Ictus” or Seizure. Some of the most common symptoms of a cat seizure include sudden collapse, uncontrolled muscle spasms, stiffness, “paddling” of the legs, salivating, vomiting, urinating, or defecating. Most feline seizures last for only a few minutes. The “Post-Ictal” Phase. This is the period after the seizure in which your cat might seem disoriented and uncoordinated or even temporarily blind. The post-ictal phase can last anywhere from a few minutes to multiple days. Keep in mind that the actual symptoms of a seizure can vary. The symptoms I listed above are just some of the most common, but the exact symptoms will vary depending on the kind of seizure your cat is experiencing. Partial seizures, which tend to affect only one side of the body. Generalized seizures that affect the whole body. Grand Mal Seizures: These seizures usually cause your cat to fall on its side and suffer from uncontrollable muscle spasms. It’s common for cats with grand mal seizures to salivate profusely and urinate/defecate involuntarily. This is when the cat suffers from multiple, repeated grand mal seizures. Status epilepticus can last for hours and lead to death. You should seek immediate medical attention if you notice your cat suffering from multiple seizures lasting more than just a few minutes. How Can CBD Help With Epilepsy? Given the amount of media attention CBD has attracted over the years, you may already be familiar with its anticonvulsant properties. You might even remember the news report that shocked the world with the story of Charlotte Figi. Charlotte suffers from a rare form of epilepsy which left her experiencing hundreds of severe grand mal seizures per week. After years of ineffective treatment using a cocktail of different pharmaceutical drugs, Charlotte’s parents discovered the power of CBD. Within just weeks of treatment using a CBD-rich tincture now sold as Charlotte’s Web, Charlotte experienced a huge decline in the severity and regularity of her seizures. From there, CBD really started to take off. More and more stories like Charlotte’s started to make their way into the news, and a multitude of studies started taking a closer look at CBD and its anticonvulsant properties. Today, a multitude of studies exist on the topic. The majority of these studies show that CBD is able to drive down the number of seizures in epileptic patients, as well as the severity of the seizures they’re experiencing. In 2017, for example, The New England Journal of Medicine published a study examining the effects of CBD on seizures caused by Dravet Syndrome. The study featured a double-blind, placebo-controlled trial including 120 children and young adults with Dravet Syndrome. Half of the patients received a placebo drug, while the others received a daily dose of oral CBD solution at a dose of 20mg per kilogram of body weight. All the patients continued receiving their standard antiepileptic medications. The treatment lasted 14 weeks, and the researchers’ primary focus was the effect that CBD had on the frequency of seizures. The group of patients receiving CBD experienced a median drop in the number of monthly seizures from 12.4 to 5.9. Meanwhile, the median monthly seizure rate for the placebo group went from 14.9 to 14.1. Another commonly-cited study comes from the highly-renowned medical journal The Lancet. Published in 2016, the study tracked 210 epileptic patients across 11 different epilepsy centers across the US and their response to CBD. The patients received CBD at daily doses starting between 2-5mg per kilogram of body weight. The doses were then upped until the medication became intolerable or reached a maximum of either 25 or 50mg per kilogram of body weight. The study showed that CBD reduced seizures by around 36%. 2% of patients also became completely seizure-free using CBD. These are just 2 popular studies exploring the effects of CBD on epilepsy. For a more comprehensive look at these studies and others, check out ProjectCBD. Does This Mean CBD Can Help My Cat? On my blog so far, I’ve written a lot about the benefits of CBD for dogs with seizures. These benefits are exactly the same for cats. I know that might seem strange, seeing as dogs, cats, and humans don’t really seem similar (at least not in a physiological sense). But one thing that we do have in common is our Endocannabinoid System. This system is made up of the main receptors that are triggered by CBD when it enters the body (namely CB1 and CB2, although there are others). Exactly how the Endocannabinoid System and CBD help to stop seizures isn’t completely clear. However, studies have shown that Endocannabinoid System is involved in regulating neurological activity in the brain and body. It does so by blocking the activity of specific neuronal channels. This suggests that CBD can help restore order to the disrupted electric activity in the brain that causes a seizure. While I haven’t personally used CBD to treat epilepsy in cats, I have used it to help my dog Rosie, who was diagnosed with hip dysplasia and cancer. Once I witnessed the positive effects CBD had on my Rosie, I began to research CBD in more detail and create this website. In my research, I learned that CBD has many positive health benefits, and huge potential as an anticonvulsant. Are Other Pets Using CBD to Treat Epilepsy? There are many pet owners who have seen success with CBD on cats and dogs who struggle with seizures and epilepsy. The Canna-Pet website, for example, is full of positive reviews of cat owners using CBD to treat epilepsy, seizures, and many other conditions. P.J, for example, is an 18-year-old cat who struggles with kidney disease. As his kidney problems progressed, P.J started experiencing seizures. His owners almost immediately started him on an anti-seizure medication prescribed by their vet. The medication didn’t work and P.J’s seizures only started getting more severe and frequent. P.J’s owners decided to try CBD and saw immediate improvements. Within a month, P.J’s seizures became less frequent and less intense. He has also become more affectionate and relaxed thanks to the medication. Next we have a testimonial from Barry. Barry explains that his dog was experiencing up to 3 seizures per day. His vet finally recommended CBD and Barry began his research. He started using CBD and instantly saw results. He reports that not only are his dog’s seizures happening much less often, they are also way less severe. This is a very common outcome. CBD might not cure seizures completely, however many pet owners report that it greatly reduces the frequency and severity of them. Rex’s story is a great one. After using CBD for almost 3 months, Rex’s owners are happy to report that he is completely seizure free! They have also noticed that Rex seems to be in much less pain, which is not a surprise as CBD is a very powerful anti inflammatory. Although Rex’s story might seem like a miracle, there are many other pet owners who have reported that CBD has totally eliminated their dog or cat’s seizures. This is not a guarantee, but it can happen. Which CBD Product is Best for Cats Suffering From Seizures? How do I know which product is best for my pet? Today I’m going to help you answer that question. I have plenty of experience with CBD pet supplements, and recommend 2 main brands for cat owners in particular. First and foremost, I highly recommend HolistaPet for its line of products tailored specifically for cats. For seizures, in particular, I’d recommend using a high-strength product, like HolistaPet’s CBD Pet Tincture. For serious health conditions like epilepsy and seizures, I find products with higher concentrations of CBD produce the best results. Alternatively, I also recommend HolistaPet’s CBD Cat Treats. Cats really love the natural salmon flavor and crunchy texture of the treats, making them super easy to administer. Plus, seeing that each treat contains exactly 2 grams of CBD, they are very easy to dose, too. My second recommendation for CBD cat products is Canna-Pet. I used this brand with my dog and was super impressed with the results. Currently, Canna-Pet offers CBD capsules for cats, which are best opened and mixed into your pet’s food. Keep in mind that these capsules will take longer to take effect, and therefore aren’t ideal for treating acute seizures. Instead, they can be used as a regular supplement to drive down symptoms over time. For more information about either of these 2 brands, make sure to check out my CBD for cats main page.